Rómulo Avelica-González had just dropped off his 12-year-old daughter, Yuleni, at a Los Angeles charter school — as he did every morning — and was heading next to the school of his 13-year-old daughter, Fatima. That’s when U.S. Immigration and Customs Enforcement agents surrounded the undocumented Mexican immigrant’s Dodge Durango. Avelica-González, a 48-year-old father of four who has lived illegally in the U.S. for more than 25 years, had been convicted of drunken driving nearly a decade ago, and there was a deportation order against him. Now, in the middle of a morning routine with Avelica-González’s wife and children, federal agents were enforcing that order. As agents patted her father down, Fatima recorded the Feb. 28 arrest from the back seat, posting a video online that has reverberated across the country and the world — reinforcing fears that school leaders and activists say are now part of everyday life for undocumented students and children with undocumented parents. These fears may deter illegal immigration. But they’ve also contributed to massive resistance, said Ricardo Mireles, founder and executive director of Academia Avance, a Los Angeles charter school with three campuses. Of its 400 students in grades 6 to 12, 98 percent are Latino, 90 percent qualify for free or reduced-price lunch, and up to 20 percent are not U.S. citizens. About half live with undocumented parents, Mireles said. When Fatima told school leaders what had happened to her father, they sprung into action. After notifying local immigrant rights organizations about Avelica-González’s arrest, school officials held an assembly to calm students’ fears, scheduled protests to garner public support, launched a fundraising campaign, and began to develop an emergency plan in case another student or family member is next. “The way we’re trying to pitch it is, ‘Yes, fear is a natural part of living, but don’t be paralyzed, don’t be in panic. Let’s use that fear to act, let’s use that fear to change our situation and be better prepared, and to emphasize the urgency of it,’’ Mireles said. As President Trump makes strict immigration enforcement a cornerstone of his political agenda, dozens of districts across the country — primarily in metropolitan areas — have adopted “sanctuary school” resolutions to ease students’ fears and protect them should they run into trouble. Though the policies can vary, they generally promise to shield students’ personal information from immigration enforcement agents and to block federal officers’ access to school property unless they present a warrant. While schools are relatively limited in the protections they can provide to undocumented students and their families, there is support at the municipal and state levels as well. Cities from New York City to Philadelphia to New Orleans have declared themselves sanctuary cities, meaning they won’t use local resources to enforce federal immigration policies. Following an executive order by Trump that called for withholding federal funds to locales that adopt sanctuary city resolutions, the Los Angeles Board of Education voted last week to join a lawsuit challenging that authority. The state has also challenged the federal government on how and where it conducts immigration raids. Since 2011, it has been ICE policy to avoid enforcement activities at “sensitive locations,” including hospitals, churches, and schools, unless “exigent circumstances exist” or other law enforcement actions lead officers to the site. But Avelica-González’s arrest prompted activists to question whether the Los Angeles agents violated that policy, and on March 9, California State Superintendent of Public Instruction Tom Torlakson sent a letter to Homeland Security Secretary John Kelly asking for an explanation. Also, last Thursday, the chief justice of the state Supreme Court wrote a letter to U.S. Attorney General Jeff Sessions and Kelly accusing the federal government of “stalking” California courthouses in order to detain suspected undocumented immigrants and demanding that the arrests stop. 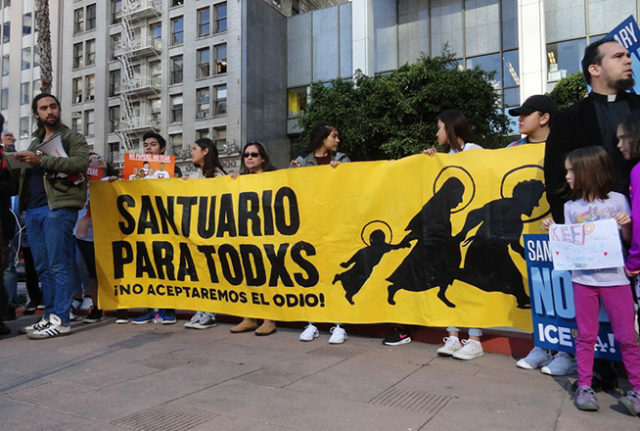 Sanctuary resolutions aren’t new, but resistance to federal immigration enforcement has reached a new high since Trump was elected president. Though largely symbolic, sanctuary school policies ease parents’ and students’ fears by ensuring that teachers and principals know how to respond if immigration agents come to a school or request student information, said Jessica Hanson, an attorney and Skadden fellow at the National Immigration Law Center who has been helping districts adopt such policies. With about 1 million undocumented children in the U.S., and an estimated 5.5 million kids with at least one undocumented parent, “It really does add a layer of security in the sense that everyone is acting consistently and knowing that ICE and other immigration agents are not allowed to access students’ information or come onto campus unless they have specific judicial documents and go through the school’s legal counsel,” she said. School systems across the country have felt the chill. In Chicago, district schools experienced a spike in absences following Trump’s election, and parents have asked whether their children are safe at school, Chicago Public Schools CEO Forrest Claypool told The 74. The district sent a memo to principals in February saying it will deny immigration officials access to schools and student records except in the “rare instance” they possess a warrant. The letter followed a December resolution declaring district public schools “safe and welcoming” for all students. In New York City, Schools Chancellor Carmen Fariña sent a letter to families in January assuring them the public school system “will do everything in our power” to ensure students are safe, referencing a 1982 U.S. Supreme Court decision that found it unconstitutional to deny children access to public education based on immigration status. In Oakland, a sanctuary schools resolution directs the district to advocate on behalf of students, so long as those actions don’t violate federal law — because if students don’t feel safe at school, they don’t show up, said Shanthi Gonzales, a district board member who advocated for the policy. The district has also held presentations to inform families about their rights and available legal resources. Noting that Oakland’s school district maintains its own police force, Gonzales said she supports de León’s bill. So does the Electronic Frontier Foundation, a nonprofit advocacy group that fights for online privacy protections. The bill would create a “database firewall,” said attorney Adam Schwartz. De León said his bill, SB 54, will reduce crime. But not everybody in California agrees. Last week, a group of county sheriffs and Republican lawmakers held a press conference to slam the legislation. If passed, they argued, the bill could jeopardize federal funding and, worse, put violent offenders out on the streets. “If SB 54 passes, it will allow dangerous, violent career criminals to slip through the cracks and be released back into our communities,” Sacramento County Sheriff Scott Jones told reporters. More than 2,000 miles from Los Angeles, in Milwaukee, Wisconsin, 18-year-old Cristal Tinajero recalled how Fatima’s video affected her. A U.S. resident whose parents are undocumented, Tinajero had already been pushing for her public school district to adopt a sanctuary schools resolution. Born in Wisconsin, Tinajero moved to Mexico with her parents for one year when she was 7 years old. Her grandmother was ill, and her parents went home to help. The following year, however, Tinajero moved back to Milwaukee without her mom and dad. She still recalls her first day of fourth grade: “I remember walking by myself that day to school, and I felt pretty sad because I saw the rest of my classmates being kissed and hugged goodbye when I had no one.” That experience was traumatizing, she said. Worrying she would never see her parents again, she struggled to concentrate in class and her grades tanked. That’s why she’s asking Milwaukee Public Schools to develop a sanctuary schools resolution of its own. The high school student doesn’t want her eighth-grade cousin, who also has undocumented parents, to go through a similar experience. A resolution proposed by schools board members Larry Miller and Tatiana Joseph resembles that from other cities, blocking the distribution of student records and requiring district attorneys to review any warrants before immigration agents are allowed to enter schools. The school board is expected to vote on the resolution in April. Back in LA, Fatima’s life has been turned upside-down by her father’s arrest. But even after federal agents hauled him away, the commotion didn’t stop her from going to school. Ironically, and coincidentally, her class took a scheduled field trip that day to the Museum of Tolerance. As for Fatima, the only thing she can do is hope her father will be released from custody. But meanwhile, she is moving forward. On Sunday, Fatima and a few family members ran in the Los Angeles Marathon.